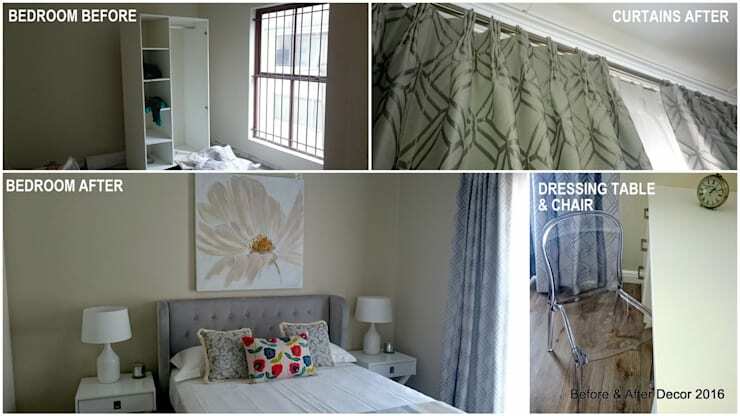 Today’s homify 360° discovery takes us to Cape Town, where interior design firm Before & After Decor show us how fitting their company name is, for they tackled a full-on apartment renovation that included styling up everything from floor to ceiling. The brief from the client? A calm space with just a pop of colour to make their 2-bedroom abode a friendly, inviting and, most important of all, stylish space to call ‘home’. 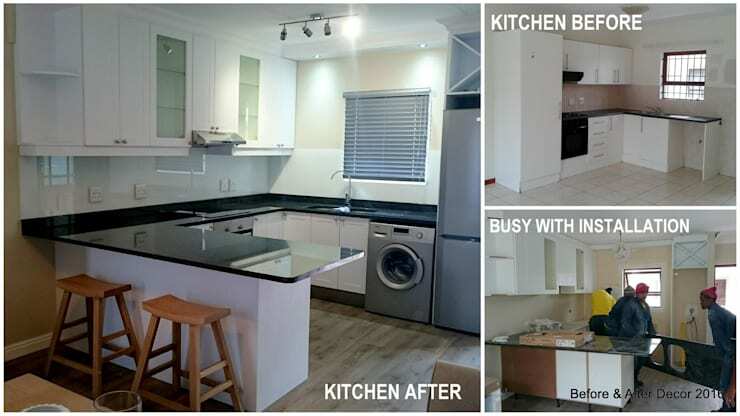 Don’t get us wrong – we are all for light neutrals upon light neutrals, but this ‘before’ stage of the kitchen was a little too… well, boring for our taste. Plus, there wasn’t adequate cooking/prepping space. Luckily, the new kitchen flaunts not only added countertop surfaces via a new peninsula, but also an informal little dining spot, complete with two wooden stools. And just look how the cabinets and floor flaunt a modern new look that adds so much more colour and texture (not to mention pattern) into the heart of this home. 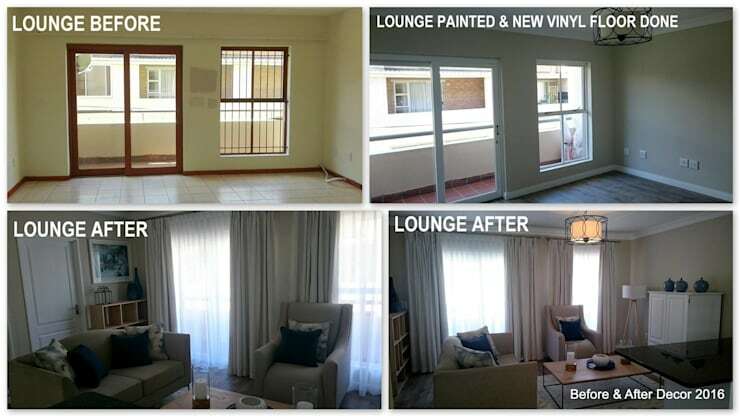 Although the lounge seemed to have presented adequate potential in terms of space, its look wasn’t up to scratch – that old tiled flooring was way too outdated and the warm-wooden frames of the door and windows didn’t blow us away. Cut to the new look, which flaunts a new vinyl flooring, as well as a much more charming style (and lighter colour) for the door and windows. Of course the additional furniture and décor pieces don’t hurt either. Bedroom? More like forgotten storage area that seemed to become cluttered by the minute. There was no style or function to speak of! Luckily, that was before. Now, the bedroom enjoys a much more welcoming look, not to mention modern style. And just check out the dashing combination of colours, patterns, décor and furniture that combine to form a deliciously eclectic look. Fortunately the most private room in the entire apartment – the bathroom – wasn’t left out of the makeover project. And here is a look we can really get behind: oversized wall tiles; a floating vanity in a crisp-white look; en elegant wall mirror; and just the right amount of stainless steel to ensure a touch of dazzle. Most definitely a makeover to be inspired by! 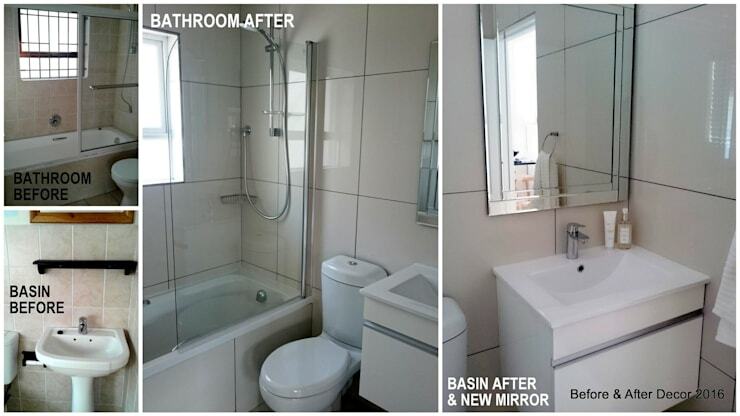 We love hearing from you, so share with us your thoughts on this apartment’s new look.